Betty Ford in the White House, 1974. For many Americans, their abiding memory of Richard Nixon is of him waving goodbye, with a victory salute, as he boarded a helicopter on 9 August 1974, his last day in office after resigning the Presidency in the wake of the Watergate scandal. In accordance with the country’s constitution, Vice President Gerald Ford was sworn in as the 38th President of the United States later that same day. 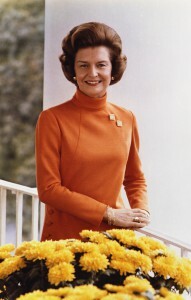 Barely seven weeks later, on 26 September, First Lady Betty Ford went for a routine mammogram at the Walter Reed Army Hospital where she was diagnosed with a lump in her breast. For two days Betty and her husband kept the news confidential, but in the post-Watergate era of White House honesty, she made the unprecedented decision to be forthright about her condition. This was a time when cancer lurked in the shadows and people kept their diagnosis private, even from relatives and close friends. Mrs Ford also chose a one-step operation, where an intraoperative biopsy confirmed the malignancy and, while still under anaesthesia, the President gave the go-ahead for the surgeon to perform a radical mastectomy. It was while recuperating in the hospital, seeing the media presence, that Betty Ford recognized the “power” of her position. By speaking openly, describing the benefits of screening, discussing various treatment options and the emotional stress of mastectomy, she increased public awareness and changed perceptions of the disease forever. Who would have thought that just 14 years later another First Lady, Nancy Reagan, would also be diagnosed and treated for breast cancer? Remarkably, Mrs Ford lived to be 93 while Mrs Reagan is still going strong at age 92. 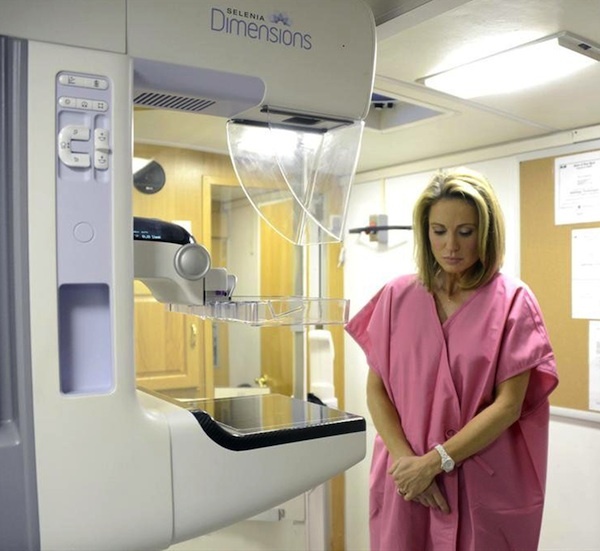 Amy Robach contemplates having a mammogram. Copyright ABC. Earlier this month Amy Robach was back on the show, telling her audience that the mammogram had turned up evidence of cancer and she was planning to undergo a double mastectomy. Her ABC colleague Robin Peters, a breast cancer survivor, had told her before she had her mammogram, “If one life is saved because of early detection, it’s all worth it.” Little did Amy know, the life saved would be her own.